I legitimately did not realize it was November until I previewed this mini-blog post and saw the date in the upper left corner. I can’t help but wonder what would’ve happened if I had waited until tomorrow, or next week to kill some time in Photoshop by making these two simple celestial-themed wallpapers and then posting them here. I mean, it might’ve been weeks before I realized the month had passed. Given my state of mind, it would not surprise me much.. I am supremely tired, and in one of those I-wish-I-could-fall-asleep-and-never-wake-up kind of moods. But every time I close my eyes my brain goes into overdrive. I can’t even get to sleep. So, I thought I’d blog. I’ve got to do something, and I’m too tired to do anything else. This one is a free PSD download. Click the image to be directed to deviantART. I’ve gotten myself into the habit of using really saturated, over the top colors in my pieces (as you can plainly see). The two pieces I made today, at the top of this post, are a bit less gaudy. I like ’em, and I want to try to get back into that style. I would also like some banana pancakes. We shall see which of these goals I am able to meet first. I have been feeling freakishly prolific lately. Hunkered down in my fortress of awesomeness, living off Junior Mints, white tea, and lots of rad music, I’ve been so completely absorbed in my various projects, I might as well be in another dimension. Most recently I’ve done up a trio of spacescapes. They’ve all been uploaded to my gallery on devaintART, but I am admittedly, possibly insufferably, pleased with these pieces at the moment, so I thought I’d share them here too, along with the layer breakdowns. Each of the breakdowns can be viewed full-size, just click the image. They’re not walkthroughs, exactly, as the process behind things I make is actually pretty darn haphazard. I add and delete layers completely randomly until I come up with something I like. So the breakdowns just give a basic idea of what elements make up the final piece. I thought it’d be kind of cool to show them as well, instead of just throwing up a finished design. Who knows, maybe they’ll even be helpful to some other artist out there or something. The day after finishing “Marvel,” I dove right into created this next piece, “I Drop Gems”. Named after “I Drop Gems” by _ensnare_. There really are no words apt enough to describe how awesome this song is. Seriously, if this is your bag, check it out. You may very well fall in love. Don’t judge right away, though. Let it’s awesomeness build up and surround you first. Besides being named after one of my favorite pieces of music, this work of mine is inspired by eatenwaffle, who I wish had more videos. (You can find eatenwaffle under a different name on deviantART.) There’s not too much of it, but this artist’s work is really stunning. I definitely recommend checking it out if you have the time. Of all the ways I could think of to spend three days, traversing the galaxy without even having to change out of my pajamas isn’t all that bad an option. I was taking a picture of a pineapple- “the perfect pineapple” I was assured by the seller- but I just couldn’t really get into it, a photo-shoot kind of mood. Still, I snapped a few anyway, opened up Photoshop and started to mess around with the vague pineapple-esque idea that had been floating around in my head. 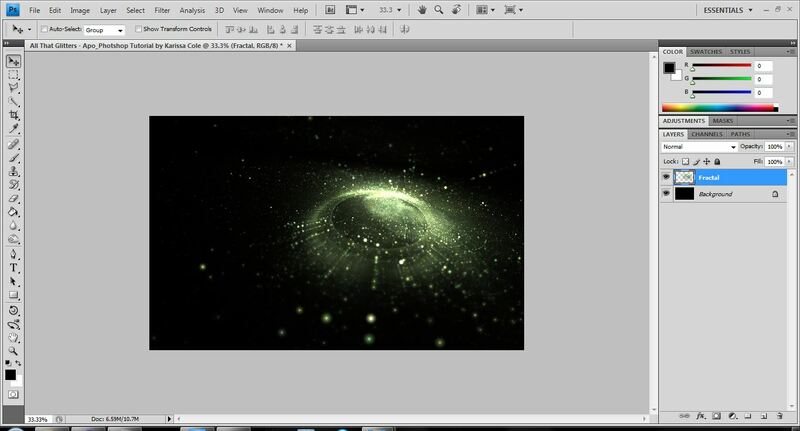 Adobe Photoshop CS4. Soft round brush + mouse. I think I kind of have crazy eyes going on here. I warned you, I’m not photogenic. No great piece of art, admittedly. But it is a self-portrait/digital painting of me. So there we go, a face to go with the rambling posts I do so love to write! Now when you read something silly or creative or funny or annoying or cute or weird, well, you’ll know what the clearly mentally unbalanced writer looks like. Granted, there are photos of me floating around this site and my deviantART gallery, but this is the first one from this year. More important than that, this is the first painting I’ve ever done like this. I’m a bit proud. Of course, when I look at all the amazing artists out there I feel like a little girl showing off her sloppy finger painting. But finger painting is lots of fun and a good way to experiment. So that’s something. For the painting, I opted to keep the soft kind of style. Actually, it’s probably pretty darn clear that realism was not something I had in mind. I had made the image a bit sharper, but I couldn’t help but prefer the softer, limited detail look. Not sure why, really. Working in Photoshop when the mood hits is almost always really enjoyable. But trying something new and getting a feeling of success makes things even better. I’m still trying to keep myself busy, keep my mind away from the melancholy that sets in when I think too much. I want to try painting some more. Already have a few ideas in mind. Of course, sometimes it feels like I have so many ideas I just can’t get them all out and done and in an orderly manner like I’d like. You know what they say: So much to do, so little attention span. Personally, I think a good tutorial should both clearly explain how the specific piece was made (so you don’t go nuts stuck with generalities, trying to figure out how they got that one detail just right), and provide several variations to try (so you’re not stuck with an exact replica of someone else’s work.) This is what I’ve tried to do here. If you follow the following steps closely, your result should look very similar to the image above. But I’ve also listed some variations you can try, so you can completely customize your final fractal. • This tutorial assumes you’ve already got working knowledge of Apophysis – how to create a flame and new transforms, where to enter in variations and variables, and how to make overall image adjustments. If you’re completely new to the program check out the Apophysis F.A.Q and be sure to also check out this icon-identifying tutorial as well. • This whole process is fairly quick – less than an hour from start to finish. But as with all digital art endeavors, it might be a good idea to save your progress frequently to avoid losing anything you make. • If you are not specifically instructed to change the value of a certain variation, leave it at its default setting. For example, the default variations for a transform are: linear3D: 1; everything else: 0. If you are asked to change julian to 2 but nothing else is mentioned, only change julian, and leave linear3D at its default value of 1. This applies to weight values (default: 0.5), too. • Screen shots follow each step. Click any screen shot to see it larger. When ready to begin, start off by opening up Apophyis 7x (or whichever version you have – it just must be 3D capable) and create a new blank flame. Not much should be happening so far, so don’t worry if all you get is a bunch of “static”. • Similar to transform 3, scale down twice by the default factor of 125. • Move the transform to the left and and rotate. Note that this transform does not need to be placed in exactly the same spot as transform 3. See photo below for reference, but experiment with placement and position. Adjust the camera settings (rotate, X axis, Y axis) as you see fit. As I mentioned earlier, I zoomed all the way out. I also shifted the fractal up and to the right a little. Now choose a gradient you like. I used a default. The gradient you choose will dramatically alter the way your fractal looks, so play around with it a bit. To spice things up a bit, hit the key combination ctrl+alt+n to randomize the color values. When you’re happy, render your fractal! We’ll then open it up in our editing program to add some glitz (a word I never thought I’d use. Ever). 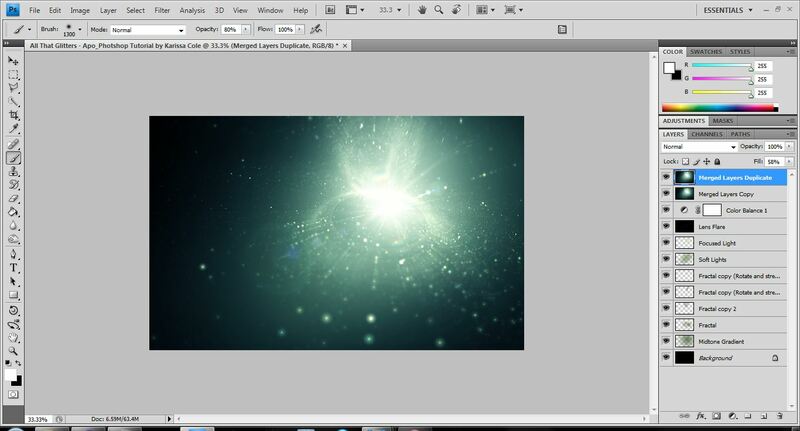 Create a new layer (ctrl+shift+n) [blend mode: normal] between your background and your fractal. With your circular gradient tool (shift+g x2) active, select a midtone color from your fractal (by alt+clicking). On this new layer create a gradient emanating from the center of your fractal. Lower the opacity of this layer, if need be. Create a new layer (ctrl+shift+n) [blend mode: screen] above your fractal. With the same midtone color and a large, soft, round brush (low opacity) selected, paint lightly near the center of your fractal. We’re creating our base light source here, so think about which bit of your image you want to be lit the most, the least, and somewhere in between. Create another new layer (ctrl+shift+n) [blend mode: screen] and repeat this process, only this time narrow down the beam of light you paint. To add a lens flare create a new layer (ctrl+shift+n) [blend mode: linear dodge] fill it with neutral (black), and set the lens flare at the epicenter of your light source. For more lighting effects, duplicate your fractal layer [blend mode should still be screen], rotate it 180 degrees, stretch it and position it so it looks like a light trail from something crashing into the center of your fractal. 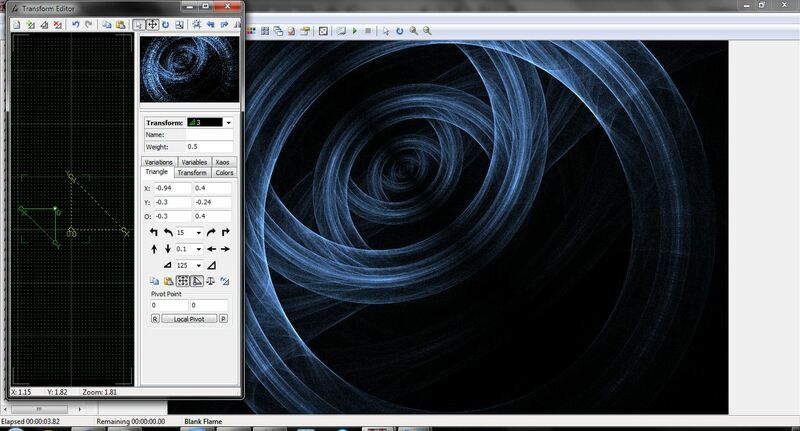 Continue duplicating your original fractal layer, warping it and positioning it in your image. Play around with the opacities of each duplicated fractal. (Be sure to erase any hard edges you may have during this part.) Optional: Create a color balance adjustment layer to fine tune your colors. 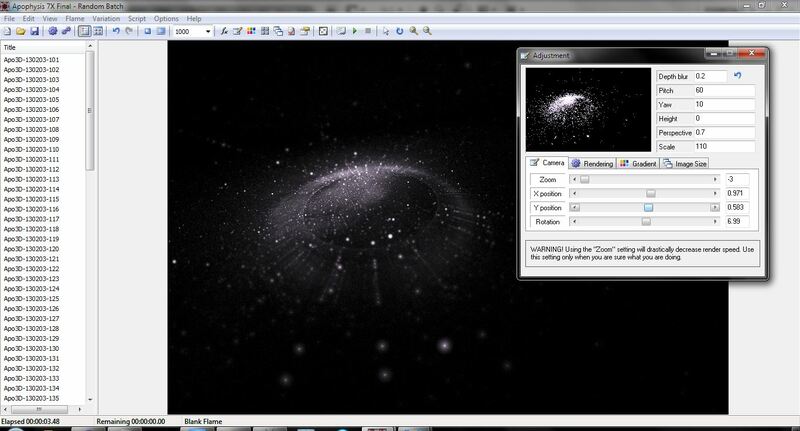 To add some neat finishing touches create a copy of all the visible layers (crtl+shift+alt+e). Duplicate this layer. To create a “glass-like” look apply the Smart Blur filter (default settings) to this layer. Lower the layer’s opacity a bit. Fuss around with the colors and sharpness of the image until you’re satisfied. Then save your image. Done! I only just stumbled across this method yesterday, so I don’t doubt that there are limitless variations one could come up with using these steps as a base. I highly encourage anyone to experiment and have fun! I think I like working digitally when I’m a bit on the groggy side. It makes everything I accomplish seem that much more awesome to me. I was sitting here for about 30 minutes trying to figure out how to begin this post. I was aiming for something elegant, sort of smooth that just draws you in, and laced with a fair amount of levity to keep things fun. But I got absolutely nothing, so I’ll just jump right in. Recently, I was perusing my favorites on deviantART and I came across an Apophysis-created piece I faved a while back made by love1008. Almost all of the Apophysis works he has in his gallery are stunning. If you have the time I highly recommend checking it out. The beautiful creations got me thinking about working in Apophyis 7x again. Fractals were the first kind of digital art I ever really got into. These days I don’t dabble too much; my computer can’t handle rendering so well. But I thought I’d play around with it today, my day off. Each was made in Apophysis, and then edited in Adobe Photoshop. I had both love1008’s and JP-Talma’s works in mind for most of these. I haven’t achieved the style I was shooting for yet. But I thought these ‘not-quite-rights’ were still worth something. I can never tell when I’ll be in the mood to work in any given medium. And since my creative side is somewhat akin to a bratty, scheming child who throws and fit and then gives me the silent treatment when upset or pushed, I just usually go with the flow and work with whatever feels right at the time. I find that I make nothing worthwhile if I try to force things. But I’m hoping maybe I can bribe that little digital artist in me to be willing to play around with this stuff more this weekend. I think I could come up with some pretty good stuff if I waded around in the program for a bit. I think I’ll rifle through my old data discs to see if I can find the original flame. It might be fun to work off of this, an image from 2009, to create some new stuff for 2013. Now, normally, I’d like to end this post with something witty. But I can’t think of anything. So I propose a compromise: I’ll pretend to say something humorous, you pretend to laugh (or at least chuckle half heartedly). I figure it’s really a fair enough deal. Recently I was asked to create a tutorial regarding some of the celestial things I make. This is not it. Actually, this is, for lack of a better word, practice. 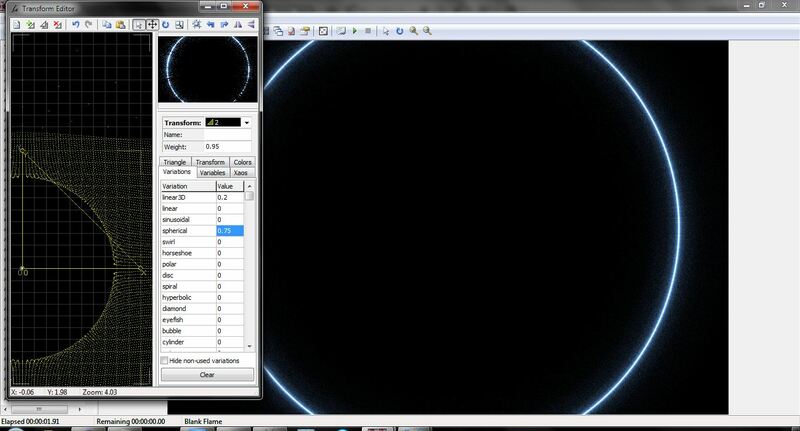 I’ve never actually made a full celestial-related tutorial before. I’ve done a few walkthroughs but no step-by-steps. This is probably partially because when I’m working in Photoshop I completely lose all track of everything – time, layers, processes – and just go with the flow, see what happens. That and I’ve never considered my work worth repeating. But there are a few beginners out there who, for now anyway, disagree and would like to know how I do what I do. So I thought it might be fun to rise to the challenge of creating something neatish and writing down the steps used so someone else could follow along. The piece above is my very rough draft. A testing ground, if you will, for techniques and design aspects. I didn’t include all of the exact steps, but rather the general methods used. The final tutorial I create will most likely deal with a more complicated image in depth; this blue one is really very simple and didn’t involve all that much. But it served me well here, where I could use it to help myself figure out how I might want to lay out the future tutorial. I’ve taken my notes and learned what I need to improve upon for the final guide. Now I just have to, you know, make it. I may end up back-burnering the tutorial for just a bit though, as, in other news, I’ve been in an amigurumi-making mood for a week or so and I’m just on a roll. Four new patterns are already either in the works or completely done. I’ve also got another relatively big project in the works. Nothing too phenomenal, but there will definitely be some new stuff – ami patterns, short stories, illustrations, and new photo shoots – showing up soon. Somewhere in all of this the tutorial will be published, of course. Keep an eye out!